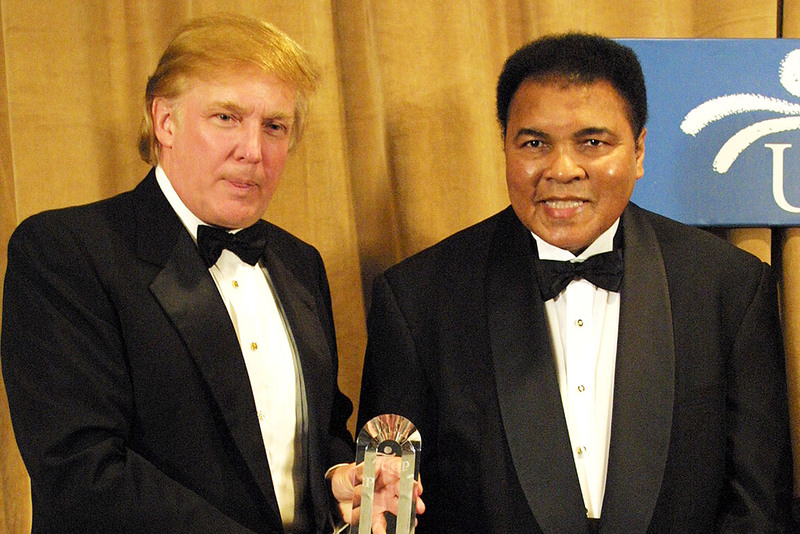 The great Muhammad Ali is dead, but that won’t stop Donald Trump trying to make political hay out of him. Hmm: Kareem Abdul-Jabbar, maybe? Shaquille O’Neal, Ahmad Rashad, Hakeem Olajuwon, Oday Aboushi, Hasim Rahman? And yeah, Muhammad Ali. Just wait: Trump will soon complain that it’s very, very unfair, disgraceful, and REALLY WEAK that Bill Clinton, the King of Jordan and Sen. Orrin Hatch were invited to speak at Ali’s funeral but he, Donald Trump, was not. Some Trumpsters are drawing parallels between their man and Ali: hey — big mouths, right? And lots of self-confidence. Plus, Ali said way more racist stuff than the Donald! OK, let’s compare: Ali scared the be-Jesus-heck out of tradition-minded white people, like in 1964 when he converted to Islam, a protégé of Malcolm X. Consider that last statement for a moment. Then go bathe in Lysol. West Point and Annapolis, take note. It’s true that Muhammad Ali called Caucasians “blue-eyed, blond-headed devils.” Slavery and Jim Crow and racial injustice will do that to you. But he didn’t practice hatred in his life. He left the Nation of Islam in 1975 and became a Sufi. Outside the ring, at least, he was a man of peace. Diane Roberts is the author of “Tribal: College Football and the Secret Heart of America.” She teaches at Florida State University. Diane Roberts teaches at Florida State University. Her latest book, “Tribal: College Football and the Secret Heart of America,” will be out in paperback in the fall.